Spectrum Group International is undertaking a complicated spin-off/deregistering transaction. Spectrum will first spin off A-Mark Precious Metals, its consistently profitable precious metals trading business, separating that good business from Spectrum’s smaller and loss-making collectibles business. Shareholders will receive 1 share of A-Mark for every 4 shares of Spectrum they currently hold. Immediately following the spin-off, Spectrum will execute a 1 share for 1,000 shares reverse split, reducing the number of shareholders in the remaining collectibles business below 300 and ending the company’s financial reporting obligations. Fractional shares resulting from the reverse split will be cashed out at $0.65 per pre-split share. In my opinion, the market has failed to accurately price Spectrum’s shares for the value that will be delivered to shareholders as a result of the transaction. This is a classic scenario in which a company’s earnings power will no longer be obscured by a struggling segment, potentially leading to appreciation once the albatross has been removed. First, a brief overview of Spectrum’s existing operations is due. Spectrum is a dealer of precious metals, including bullion and coins. While I believe the investment value of such items is dubious at best (and I think I am in good company), many seem to disagree and gold, silver and platinum coins and bullion are in demand world-wide. Spectrum serves as middleman between buyers and sellers of these items and also provides secured loans to precious metals collectors, dealers and investors. Spectrum’s collectibles division deals in rare and antique coins and wines. It must be noted that Spectrum is not a precious metals speculator, and does not attempt to profit by trading precious metals futures or physical metals. Spectrum profits regardless of metals prices, simply earning a spread on transactions. Spectrum has been consistently profitable, though its profits have ranged widely in recent years. On average, Spectrum earns the majority of its pre-tax income through its lending operations. The historical results shown below are adjusted for one-time items like goodwill write-offs and litigation expenses. Spectrum’s consolidated historical results tell only part of the story. 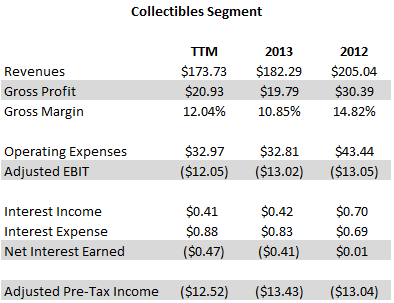 In reality, Spectrum’s strong A-Mark business has been subsidizing heavy losses from the collectibles business. The figures shown below are adapted from the company’s proxy statement dated February 7. The collectibles business accounted for 38.7% of Spectrum’s total gross profits for the twelve trailing months, but a whopping 68.3% of operating expenses. The segment’s adjusted pre-tax net loss has exceeded the entire company’s adjusted pre-tax income since at least fiscal 2012. Clearly, Spectrum’s reported profits would look much better if the collectibles division’s losses were excluded. And that’s exactly what will happen once shareholders receive shares in A-Mark, the precious metals trading business. Spectrum has provided pro forma historical earnings data for the A-Mark business alone. For each share of Spectrum currently held, shareholders will receive 0.25 shares in A-Mark. The implied look-through A-Mark EPS per share of Spectrum is $0.42. At Spectrum’s current share price of around $2.60, the implied valuation of A-Mark is extremely conservative, especially when the value of the remaining business is taken into account. The situation is best for smaller Spectrum shareholders who own fewer than 1,000 shares. The $0.65 in cash per share they will receive from the reverse split brings the current share price to $1.95, which values A-Mark Precious Metals at only 4.6x trailing earnings. Holders of more than 1,000 shares face the conundrum of projecting the value of the remaining collectibles business, since their shares will not be cashed out in the reverse split. Conservatively valuing those shares at 30 cents each, less than half of the reverse split valuation, Spectrum’s current share price values A-Mark at 5.5x trailing earnings. Disregarding the value of the collectibles business altogether still values A-Mark at only 6.2x trailing earnings. 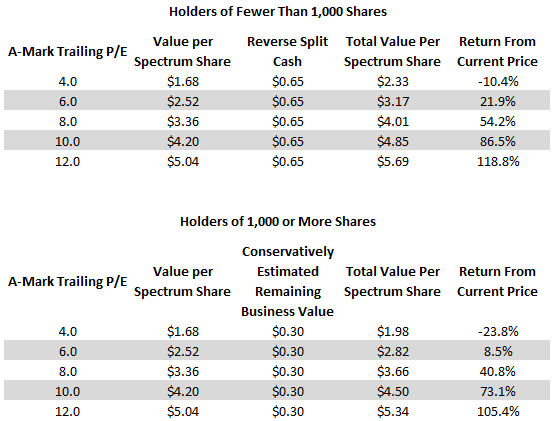 The tables below show the current value of Spectrum’s shares at various A-Mark P/E ratios for both large and small shareholders. At a very reasonable 8.0x multiple of A-Mark’s trailing earnings, Spectrum’s current value per share is $4.01 for small shareholders and $3.66 per share for larger shareholders. Either of these prices represents a large premium over today’s price of around $2.60. Purchasers at the current price have a good chance of realizing appreciation once Spectrum’s losing collectibles business is separated and A-Mark’s earnings power becomes apparent. Alluvial Capital Managment, LLC holds shares of Spectrum Group International for client accounts. It appears that we should now wait for AMRK shares to begin trading at a value south of $8 for a profitable trade…agree? I think the actual last day for investors to purchase shares of Spectrum and still receive the A-Mark spin-off is a little unclear. The updated S-1 refers to “holders of SGI common stock as of the close of business on February 12, 2014,” not “holders of record” on the 12th. I interpret that to mean any investor who holds shares of Spectrum at the close of trading on 2/12. If the ex-date were actually a few days back, we would have seen a massive overnight drop in Spectrum’s price prior to now. However, if the stock opens tomorrow down roughly $2 per share, we’ll know that one cannot buy in tomorrow and receive the A-Mark shares. In that case, likely would be better simply to buy the newly floating A-Mark shares and ignore legacy Spectrum stock. From what I read in the S-1 if you own SGI at the end of the day today (2/12) you will received the shares. i think that you should check the past of the company and management, they changed their name to spgz ( formerly scala ) due to some scandals. The management associated with an spanish ponzi scheme related to stamps( afinsa S.A. ), that’s why their sotck rose in ’04-’06. But once the ponzi scheme in spain collapsed, they went bankrupt, because the scheme was their biggest costumer AND their biggest investor. They also put in place Mr. roberts who also will be the CEO of A-mark. That fact strikes me a little bit. the good point is that during the court process in spain related to the ponzi scheme ( around 2Billion € in damages) SPGZ management bought afinsa’s stake. I think that as insiders they must know something since they paid 35-40M$. Can you share the link to the updated S-1? I can’t seem to find it. Take a look at the compensation plan. A-Mark is a fine business, but the CEO stands between it and shareholders, and no cash makes it past him. The combined company’s weak results are primarily from high corporate expenses. A-Mark will also have a terrible comp plan (unless you’re the CEO). Thanks to all for the helpful comments so far. Management compensation is clearly absurd at A-Mark, which is why I would not buy the company at a market multiple. However, I do think the company is worth 8-10x trailing earnings, a good deal higher than the current valuations. I’ve actually heard Mr. Roberts present on Spectrum in person, and while he was anything but charismatic, he seemed to understand his industry very well. One more item of note: Jess Ravich is joining A-Mark’s board of directors. I think a lot of Mr. Ravich’s abilities. He’s the one who was so successful with ALJ Regional Holdings. I am planning to buy 999 shares in my account. However, the company requires that shares must be held by shareholders of record. Can someone please explain to me if I buy 999 shares today, will I get the cash from reverse stock split? Fan, I believe that if you buy the shares today you will get the cash from the split. I am not 100% sure but that is how I interpreted the language in the S-1. I bought shares today. Thanks B. I checked the documents. It says it will apply to shareholders of record. However, since the reverse split is not followed by a forward split, I really doubt the company will be willing to issue a 0.999 share. I still trying to read through as much as I can to see if there is anything to notice though. Thank you all for the helpful comments! Thanks for the idea, very interesting. Can you provide some color on why you believe this business is worth 8-10x? Who are the relevant comps? Any sense of what ROE has been in the A-Mark business? Seems hard to believe this would be worth 10x w/Goldman at 10x. In this case I did not use comps. However, you can find a list of comps in Spectrum’s most recent proxy statement, where the median trailing P/E for comparable companies is 24.3. A-Mark’s reported ROE, roughly calculated from the S-1 filing is somewhere north of 20%. I view 8-10 times normalized forward earnings as the valuation floor for a stable business. The reason is this: Long-term returns to shareholders can be very basically modeled as current earnings yield plus long term-growth. This is a variation on the classic Gordon Growth Model. A company with zero long-term growth should trade at a forward normalized P/E multiple of 1/(cost of equity). That’s the P/E at which the earnings yield equals the cost of equity. I think most small public companies have a cost of equity of 10-12%. The cost will increase if and when interest rates rise, but that’s my estimate of cost of equity right now. A zero-growth company with a cost of equity of 10% should trade at a P/E of 1/.10, or 10. A zero-growth company with a cost of equity of 12% should trade at a P/E of 1/.12, or 8.33. Knowing that, if I buy companies for 8-10 times normalized earnings, I think I have a very good chance of earnings good returns because I am essentially getting all potential long-term earnings growth for free. For example, if I buy a company at an earnings yield of 12% and it succeeds in growing its earnings at 5% annually, I will actually earn something like 17% annually, disregarding changes in valuation ratios. Goldman probably trades at 10x because the market fears that the company will not be able to sustain its return on equity due to regulations (Volcker Rule, etc.) and exiting some profitable business lines. I have no idea if the market is correct, but that is the fear. Thanks that is helpful. As far as I can tell the comps listed in the proxy all relate to the auction side of the business. Are there any pure play publicly traded metals trading businesses out there that I can look to to get a sense of relative valuation? Thought I’d post a link of SPGZ’s latest press release which details how SPGZ shares will trade between the record date and actual distribution date. Just in case anyone hasn’t already seen it. SPGZ will continue to trade with rights to receive A-Mark shares up until the 28th. I think everyone was in agreement that it would trade this way until the 12th, but since the actual distribution date is the 28th it looks like that is the new drop dead date to acquire shares with rights to receive A-Mark. Well I tried to post the link but it looks like its not working. Anyone else mind posting the link just so people don’t take me for a fool? Hi Daniel, sorry that your link didn’t work. The blog settings disallow links by commenters because I have had issues in the past with spammers. I posted the link in another comment. It is my understanding that this spin off is considered as a special dividend since it represents a large percentage of the stock price. As such, I believe the rules are that the ex-date for receiving the spin off shares will be the first trading day after the payable date. If payable date is Feb 28th, then the 28th is the last day to buy shares and still get the spin-off. Otherwise, March 3rd, the stock trades ex-dividend for the spin off. That is my understanding. Is there any possibility that if you purchase the shares now, you end up not getting the spinoff distribution? From the press release, it mentioned shareholder of record 12th Feb.
Can you write a little bit about how you found this opportunity. What was the screen, news event, etc. that piqued your interest? Honestly, it was Twitter. I have followed the company very casually for a few years, but never invested. Then last week I saw a user I follow begin tweeting about Spectrum and A-Mark’s implied valuation. Sure enough, I did the research and came to agree. I was a Twitter skeptic for the longest time, but I’ve actually found it to be incredibly useful if you follow smart people who talk about value investing ideas. -Also on February 12, 2014, the Board of Directors of A-Mark declared a dividend to SGI in the amount of $5 million. The dividend will be paid prior to the Distribution Date. The above is in addition to the following dividends (found in the prospectus): 5M during QE9.30.13, 15M during YE06.30.13, and 3.7M during YE06.30.11. My guess is that the collectibles segment did so badly the last quarter (YoY quarterly revenues down nearly 50%) they needed it for working capital. -I also saw that corporate expenses more than doubled to 4.8M, they noted that a portion of this went towards professional and other fees related to the reverse split/spin off, but I didn’t see a breakout after reading through. I’ll continue to read and digest but wanted to vent a little and point out the above items to everyone and see what others thought. Did anyone else notice the 13G filed yesterday by Bank of America? They now own 5.59%, very interesting. I recall the scandal well, and can say with some certainty that anyone within 100 feet of that scam was/is a crook. No idea if this a a good trade or not, but there is a strong taint if any of the past players are still around. Now they’re buying back 3 million shares for $2.10/share? Yeah, this new agreement with Afinsa and Auctencia will effectively reduce A-mark’s oustanding shares by 10%. So while I was complaining about that last minute dividend they did on the 2/12, it may relate to this. Although the spin-off may be delayed a week or two, this is still certainly a big positive for those betting on A-mark’s stand-alone value. Why is Afsina and Auctencia selling their shares before the spinoff? Why at such a big discount to the current market price? Those companies are in bankruptcy/liquidation, so any source of liquidity is benefial for them. Also, negotiated sales below market are extremely common in the micro-cap world, where large holders would not be able to sell their shares into the open market without profoundly affecting the price. I see that as a positive development to finalize the separation between A-Mark and the scandals that took place in Spain. That money will prob go into settling litigation for Afsina and Auctencia. A-Mark filed a registration statement today with the SEC, stating shares will trade on the NASDAQ, so progress in the right direction. I’d expect to hear something by the end of the week since they said early March, and after March 15 it will no longer be early March. I assume this registration means their listing application was approved by the NASDAQ. If anyone knows differently or knows a way to find out, please let me know. I read they announced NASDAQ approved application to list A-Mark under symbol AMRK. All conditions for spinoff have been met and the company intends to announce the date of the spinoff shortly. On the first trading day after the Distribution Date, March 17, 2014, A-Mark’s shares of common stock will commence trading on the NASDAQ Global Select Market under the symbol “AMRK.” Up to and including the distribution date, the SGI common stock will trade on the “regular-way” market. Who was on their toes and sold off their SPGZ shares for $2 at the open this morning? Could have basically gotten the AMARK shares for free. Either we are wrong about the ex-div date or others are confused about the ex-div date or buyers want the collectibles business and value it higher than we expected. The last alternative is possible, but if the case, I would have expected SPGZ to trade higher on the sum of collectibles and AMRK. Guys, I am confused here. SPGZ stub now is trading at 0.83. However, shareholders with less than 1000 shares will get 0.65 in cash. Isn’t it better to just sell it now? Or I am mistaking something? you are not mistaken. there is clearly a real buyer who simply wants to own this thing post reverse split. the 65 cents is no longer relevant (it is a free put, of course). but clearly someone wants to own this at 80 cents. i thought the buyer was making a mistake (clearly, the $2 buyer that AR hit was making a mistake), but that cannot be the case any longer. AMRK is listed and trading and shares have been allocated. At today’s price of about $13, AMRK is still cheap at under 8 P/E. One thing to consider here with SPGZ might be your tax implications. I think they said something in the filing that the $.65 distribution would be tax free to shareholders; however, if you sell at $.80 right now that will almost certainly trigger a short term capital gain (assuming you bought recently). Thanks. I sold them @ .83. I pay my tax in Canada and since I do not have any regular income, those will be taxed @ 7.5% I believe. If AMRK shares hit the account, I would be more than happy to sell them @ 13 since this thing already gave out a 50%+ return in a month. It could not be better! BTW; I never understood why I cannot buy shares on the OTC market in my RRSP accounts, while I can do it in an IRA or ROTH account. It could have been fabulous buying SPGZ in those accounts. amrk is a great invesment at 13.
without growing it worh 20 dollar so the up side is big in my opinion. Did you recieve your A-mark shares from the split today? Mine have not shown up in my account. I was thinking the same thing AR was thinking. Could have gotten paid to buy AMRK shares in this one if your original cost basis is fairly low. First trades of the day were at $2.61. Wow. At first I assumed I had made some kind of mistake so I was slow to sell. If I was a little quicker I could have sold at $2 or even possibly $2.61. Not too much to complain about though lol. I totally misplayed this one. I played it for the odd-lot, buying 996 SPGZ shares. I should have realized 2 things. First, the majority of the value was in the AMRK shares, not in the 65 cents left over on the SPGZ stub. Second, the odd-lot arbitrageurs would keep the SPGZ bid somewhat close to 65 cents, so the “put” at 65 cents really wasn’t worth a whole lot. I actually ended up selling my stub shares at 83 cents yesterday and then going long again at 52 cents with an odd-lot. Can you still get the guaranteed $.65 takeout if you buy now? The date of the going-private reverse split transaction has not been officially announced, but the company has not indicated they have changed their minds. The original announcement only said that the reverse split would occur some time after the completion of the spin-off. You aren’t alone. In hindsight, I misplayed it as well! Still made money, but I could have made more. Yeah, the % return was fantastic. Thanks for the idea. I hate to throw away these types of opportunities…I guess hindsight is always 20/20. I saw CASA got bought out today. I tried to buy some after reading about on your blog about a year and a half ago. Couldn’t get very many shares though. Hope you owned a bunch! I wish I still owned CASA! I sold out a while back when management seemed to lose focus on debt reduction and began building a new restaurant. I made a great return but I could have made quite a lot more. In hindsight it is always easy to say, I should have made more money. SPGZ was not a bulletproof bet. At least, I was not expecting the return that handsome. I started buying shares at 2.5 in multiple accounts and stopped because the price went to 2.7. So I misplayed this in a different way! But this really is a good lesson to learn when the spin-off has a larger portion of the value and we need to think differently. One more thought. I was not really paying attention to this one. To be honest I just spent like less than an hour on this and built my position. However, this is a very unique special situation because it involved a spinoff and a reverse stock split and a value-heavy spinoff and regular way trading and money losing parent and a very profitable spinoff….. how could this not be one with explosive potential!!! I am still happy I learned a lot from this one. I will probably still participate in the reverse split but will wait for the shares to drop a little. Kevin, nice sale and purchase. I should have done it since I sold the shares @ 0.83 too. Market cap information on many websites for AMRK is super wrong. Technically it’s trading with a market cap of ~100m not ~400m. So its P/E is actually around 8 as opposed to 32-34 as many websites imply. I’m probably going to wait to sell till AMRK starts showing up properly on screeners. In the past I’ve seen a few of these going dark transactions result in prices that make no sense right before the actual transaction. About a year and a half ago I bought into a company called Helix-Biomedix doing a cash out stock split for shareholders of less than 300 shares at $.6. The shares began trading hands at $.5 (can’t quite remember the stock price but around here.) Shares eventually went to $.1 and lower with only 1-2 months to go until the going dark transaction. An astute investors could have turned $29.9 into $179.9 for an annualized returns in the millions of percent. Transaction costs were so high compared to the investment that it appeared I lost a large fraction of my money upon entering into the transaction. This case may turn out to be similar to Helix Biomedix because there are a few large institutional shareholders who cannot own the stock if it deregisters. So either they are selling now to buyers of odd lots or they are asleep at the wheel and will be selling when the stock deregisters after reverse stock. That being said I’m probably going to start a position close to prevailing prices. I misplayed this on so many levels it’s just painful. Really appreciate that you did the write-up though, thanks! I appreciate the write-up very much as well, hats off for highlighting such an incredible opportunity. Luckily, I decided against limiting myself to <1,000 shares and made it a larger position. There are certainly some strong bids on AMRK and I can't imagine too many more people know about the specifics now than did before the spinoff. I agree with what Dan said above as once the situation becomes more obvious to a larger crowd, I think many more investors will want to own AMRK. Now many of us have a good problem to deal with, when to sell and realize gains! If I owned shares of SPGZ before the spinoff, when will shares in AMRK be added to my Etrade Account? I would guess sometime tomorrow. I use OptionsHouse and expect them to be in my account tomorrow. Anyone still holding the SPGZ stub? SPGZ got a $5 million dividend prior to the spin-off and has now disclosed that it has a $14 million income tax receivable. I believe its book value is now north of $40 million, but the cash out price is less than half that amount. Has anyone received cash from the 999 shares or less offer? Haven’t received the cash yet, but the ticker was replaced with a cusip, so it shouldn’t be much longer. Are folks still waiting for the cash? Got my cash a little while ago. Scratch that, I confused it with another reverse split. Still waiting on the cash as well. still waiting for my cash.